Carioca - C.Am.Loba - thanoscardgamess jimdo page! Carioca is played Argentina and is a version of Contract Rummy. In Central America a similar game called Loba is played (different to the Argentinian Loba game). Carioca is a series of seven rounds. In each round, the players strive to get rid of all their cards, and when one any player manages this, the round is over. 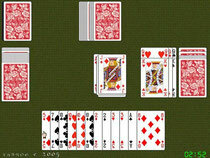 The other players receive a penalty based on adding up the point values of the cards left in their hands. The player with the fewest points at the end of the seven rounds is the overall winner. The object is to get rid of all the cards from your hand, and this can only be achieved by putting down cards (sometimes called melding). In order to be allowed to put down any cards at all you must first collect in your hand the combination required for the round being played. This is called the contract, and it becomes more difficult on each successive round. You may also play the Central American variant which has only six rounds.